Okay, so maybe the dentist came to Wally in the form of my vet, Jennifer and her able assistant, Mark. Wally got his teeth floated yesterday and, judging by his reaction, it apparently was not the Number 1 thing on Wally's wish list for Things To Do on a Monday. He was not happy with the whole idea, so he had to be tranquilized. But he desperately needed to have his teeth floated, so it became a case of, "We know you don't like this, but it's good for you, so let's get this over." I've owned Wally less than a year, and I began to notice signs that his teeth needed attention. Wally has an overbite, so that alone makes his teeth wear unevenly. But he also salivates a lot, so I figured he needed Jennifer to look at his teeth. They were in pretty sad shape: ulcers (Jennifer called them "erosions") lined the inside of his mouth and he had sharp edges and hooks on several teeth. It was apparent he hadn't had any dental work done in a while. 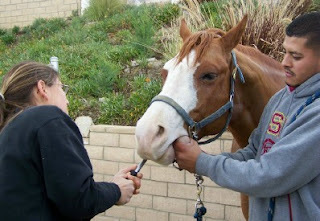 While Jennifer said she could do a cursory job and take care of the erosions in his mouth, Wally will need a follow-up visit with an equine dentist later this spring. That person has the full assortment of dental equipment necessary for a patient like Wally. Wally says he's in no big hurry to make that appointment. While Wally was in la-la-land, Jennifer also cleaned his sheath. I know that non-horse people run in horror at the thought of cleaning a gelding's sheath. My husband heard what was about to take place and he sort of shivered, wrinkled his face and took refuge in the house. But just like his teeth, Wally's sheath needed attention. I'd tried in vain to do the deed myself, but I'd been unsuccessful. But with Wally sedated and Mark holding the stud chain, Jennifer went to work and got the job done. I'll spare you any photos of Jennifer up to her elbows-- literally-- in her work. Besides Wally getting some much needed veterinary attention, Lexi also got her foot inspected and x-rayed. The good news? It's a bruised heel. So much for my catastrophizing that it was something much more malicious. I should've known, because in reality Lexi is much, much better. That fits, because according to Jennifer the x-rays showed, "nothing remarkable." In fact, since Jennifer had done the pre-purchase exam on Lexi a year-and-a-half ago, she had the old films for comparison. These recent x-rays were virtually unchanged: no ringbone, no sidebone, no "galloping navicular" as I call it. So now I just have to spend MORE MONEY to put Lexi's front shoes back on. Because, as you know, it's a rule that horse owners are never permitted to accumulate any amount of wealth. Any excess funds will be immediately re-distributed to the four-legged beasts in some form, dental, sheath-cleaning or otherwise. What is galloping navicular? I'vew heard the word navicular before(i think) but i don't know what it is. I guess it's navicular stress? I googled it and nothing came up except stress on the joints. "Galloping navicular" is just a pet term for a case of navicular that comes on extremely quickly. Most times navicular progresses relatively slowly over time, with lameness increasing as the syndrome advances. But in some cases, the navicular progresses very rapidly with the horse becoming lame seemingly overnight. So, while you likely won't find an official veterinary diagnosis of "galloping navicular," your vet or trainer probably has a similar term to describe a rapid-onset case. Gina and Ami: I'm glad that my sister was reading my blog and had a chance to answer your question about "galloping navicular." LOL! I guess there are homegrown terms and lingo that become popular within certain regions or groups of horse people. You both made me realize that perhaps I need to compose a topic relating some of these "pet terms" and their definitions. I'm confident you'll recognize some of them if not by name, then by their meaning.